Why Choose Schaaf Plumbing & Heating? If you’re tired of looking for a reliable local plumber and you think the big companies are unfair and charge too much, then you’ve come to the right place! Schaaf Plumbing & Heating is your local “big company” and we prioritize customer satisfaction over price gouging. Our prices are universal, not depending on the area. We charge the same, EVERYWHERE we do business. Our highly skilled employees have years of experience. You can expect us to deliver high quality craftsmanship at reasonable rates. We’re honest, friendly and professional plumbers who only have one job and that is customer satisfaction. License #9943. Take a look at what your neighbors (our customers) are saying about our work. We’ve been perfecting our craft since 1941, and although our industry has continued to change since then, with new standards and advanced technology, Schaaf Plumbing & Heating remains dedicated to providing you with the best possible plumbing solutions. We respect your home and take extreme care when we work on any of your plumbing and heating systems. We’ll work around your schedule for convenient appointment times. You can count on our friendly and knowledgeable technicians to be there for you in the event of an emergency or be on time if you schedule an appointment in advance. Take a look at what your neighbors (our customers) are saying about our work. I have worked with Manny and his team on various occasions now. They take pride in their work and do the job right. Most important to me is that they keep their word, and operate with integrity. I had some pipes changed under my sink, and after his guys left i still saw a small leak (ended up being unrelated to their work) , manny still came out after hours to check it out and make sure i was satisfied. Prices are reasonable and you get a reputable company that backs the work they do. After a lot of bad experiences with other companies, i can highly recommend schaff plumbing without hesitation. I've used numerous plumbers in NJ; and by far Schaaf Plumbing is the best in terms of workmanship, reliability, trustworthiness, and price. Manny is an awesome boss, and his main plumber who worked in my house, Mike, is a man among boys in the plumbing industry. Few difficult issues came up while Mike worked on replacing a water heater and 2 toilets - yet Mike handled them extremely well as a true professional. Thumbs up! I called Schaaf Plumbing because my outdoor faucet needed to be replaced. I decided to go with Schaaf Plumbing because of the great reviews that I saw on Google. Within a couple of hours of placing my call, Sean and Ramon were at my door. I'm extremely pleased with their workmanship. They were both very friendly and knowledgeable. They are now my go to plumbers. I highly recommend Schaaf Plumbing to anyone. Thanks Sean and Ramon! George Schaaf established Schaaf Plumbing & Heating in 1941. He grew his family-owned business one satisfied customer at a time by providing exceptional quality plumbing services and developing the trust of those he served. Schaaf cultivated a strong reputation of honesty and dependability that is embedded in the company to this very day. Current owners, Joseph Hroncich and James Tarabokija worked with George for many years, and then assumed ownership in 1995. 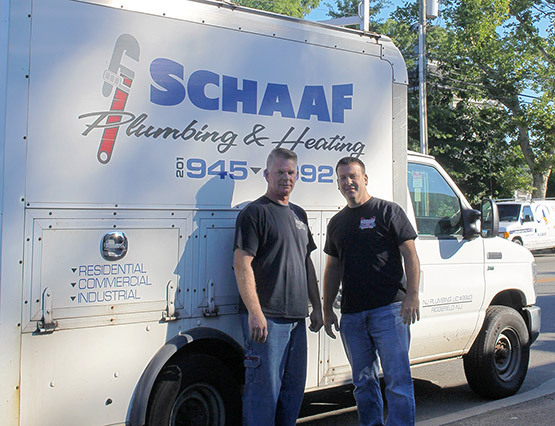 Still family-owned, and guided by the same founding principles, Schaaf Plumbing & Heating is operated by Joe and Jimmy with uncompromising values and sound business practices. 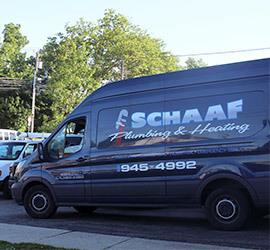 Over the past 25 years, Schaaf Plumbing & Heating has grown and expanded throughout New Jersey and the surrounding areas, but our mission remains: to provide the highest level of customer service, with the best quality, at reasonable prices. Our unique “Project Pricing” is not typical in this industry. We don’t charge by the hour, we charge by the job. With our up front pricing, you’ll know the cost of the job before we start! Give us a call, to get a free estimate.